What God Said About the 4th of July - Heart. Soul. Strength. Mind. 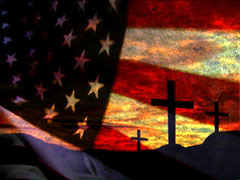 The American flag should not overshadow the cross. Two years ago, my younger son was having regular conversations with God. He was visiting with God in a way in which he could literally see and hear him. One day, he and God were talking about holidays. He shared the conversation with me. It turns out that God isn’t at all pleased with our holidays. My son told me how God finds Halloween to be an incredible abomination and Christmas to be the worship of things, not his son. Things got weird, though, when he started talking about God’s opinion on Valentine’s Day, a day during which much sexual sin is committed.(!) Then he talked about the 4th of July. He told me that God said that the 4th of July was idol worship. I asked him why. He said it was because people were honoring the country over God. Note that all holidays are not awful. God likes Thanksgiving, according to my son. At any rate, prior to that time, I had not given any thought to the 4th of July and any underlying meaning it might have. I was frankly stunned to hear those words coming out of my child’s mouth. Since that day, though, I have become more and more convinced that my kid did indeed hear God’s voice that day. That American Christians don’t question what they value. That we follow culture before Jesus. Stuff like that. I’ll leave it up to you to decide if he really heard the voice of God. I’m pretty wary of saying things like, “Thus sayeth the Lord.” Nevertheless, it’s food for thought, right? As a Jesus-follower, I consider myself a citizen of God’s Kingdom. The rest is small change. This entry was posted in God, Supernatural, Uncomfortable Truths and tagged 4th of July, Christian nationalism, holidays. Bookmark the permalink. I love Thanksgiving and agree about Christmas. I’m torn on Halloween because I do like the costumes and candy. As for the 4th, it really has little to do with patriotism these days and everything about explosives and drinking. And grilling meat. Don’t forget the BBQ! However, I’m willing to bet that the further south you go, the more patriotism you’ll encounter. A wise 12 year old. All “holiday” are man made and not part of the New Covenant. They cause men to stray from Christ in many clandestine ways. We must not be self righteous about our unwillingness to participate in such things, however the 4th of July is wicked idolatry and part of nationalism which is allegiance to a fallen nation. Only 12 years old and desiring to delve into such deep things about which even preachers are willfully blind. Wow. The really bizarre thing here is that my son’s spiritual insights began before we started going to church and really considering these things. He experiences intense spiritual warfare, which has been diagnosed as “schizophrenia” by the professionals. Valentine’s Day is an interesting one because it’s actually named after a saint! This is an interesting perspective. I guess it’s how you look at it. It certainly can be worship of idol. However, I guess you can sort of look at it as an anniversary. I wonder what God think of anniversaries. What is important is that we are desirous to study the holy Bible. God is good, so let’s focus above all on Lord Jesus who is good. Let’s focus on His words and deeds and let’s focus on deepening our relationship with Him. Having a love for one’s country and the rest of the world is a gift from the LORD God. As we love God and stay loyal to Him He will fine tune all our other loves so that bring Him glory. I don’t know! He didn’t say. I think it’s idol worship because people put their safety, liberty, nationalistic feelings –whatever, above the commandment to love our neighbor. I don’t see how it is possible to love our neighbor when we are killing them to protect these ideas. As we love God and stay loyal to Him He will fine tune all our other loves so that they bring Him glory. As a Canadian we also have many holidays like the 1st of July and I was at the parade distributing Bibles for the Lord with the Gideons. As many Canadians were wearing white and red ; one man taught it was wonderful and I said gently but firmly as long as we love Jesus more than the parade.. I chose to enjoy myself and pray for people but it did bother me some that so many were willing to show up to watch bands play and some people were there 3 hours before the parade. I should go next time and pray just 1 hour before church. It is easier to watch and see with our eyes than to believe with our heart what we can not see but to see with the heart of God. I bless you all of my American brothers and sisters with meaningful relationship with our Lord Jesus Christ and much discernment and revelations. Danielle Gamache with love, gratitude and wonder. I’m going to stay out of the discussion of what God thinks or doesn’t think, because my suspicion is that the evidence we have is too colored by human desires and has gotten too far away from the truth to really know. What I do believe is that your son experienced something valid and worth considering. Now the task is to guide him away from a judgmental attitude… something I completely missed when i was raising my kids, unfortunately, because I didn’t have the concept of it myself. This is a really good point. I am having to perform the task of moving *myself* away from having a judgmental attitude as well. Jesus as man and God demonstrated His love for the world by pouring out His soul unto death! You are right true safety and freedom is found uniquely in Christ Jesus. There is no higher demonstration of God’s love than in the perfect atoning work of Christ. The LORD continues graciously to pour out His love toward man, both saved and unsaved. Loving fellow Americans and other citizians of the world who are our neighbors is His good, acceptable and perfect will! Our allegiance is not to a flag but to the author of life, the author and finisher of our faith! Very well said, agreed. Your little guy is special to hear God at such a young age and to have a close relationship with him. I believe that every relationship with God is unique and deserves respect. As for Halloween…. I’ve recently made the course correction and acknowledge it as wrong. We enjoy taking our children to church fall festivals they can dress up and play games and receive candy in the spirit The Lord accepts, and the children are much safer and have more fun!